Performance Time: Approximately 15 mins, 15 pgs. COMEDY. In “Bathroom Break,” a mother yearning for some time to herself has to lock herself in the bathroom to get a break from her needy husband and teenaged kids. 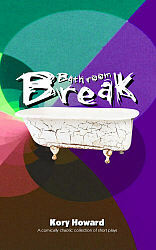 Included in the short play collection, "Bathroom Break." Kory Howard is a teacher and theatre coach at Manti High School in Manti, UT. He enjoys writing, teaching, and spending time with his family. He resides in Ephraim, UT, with his wife and three daughters.